Pink and Gold 1st Birthday Ballerina Slippers Birthday Tutu Outfit. Personalized with your baby's name. Available for all ages, colors and ages. Rush Orders Available please contact me for more details. Tulle is hand cut and sewn. 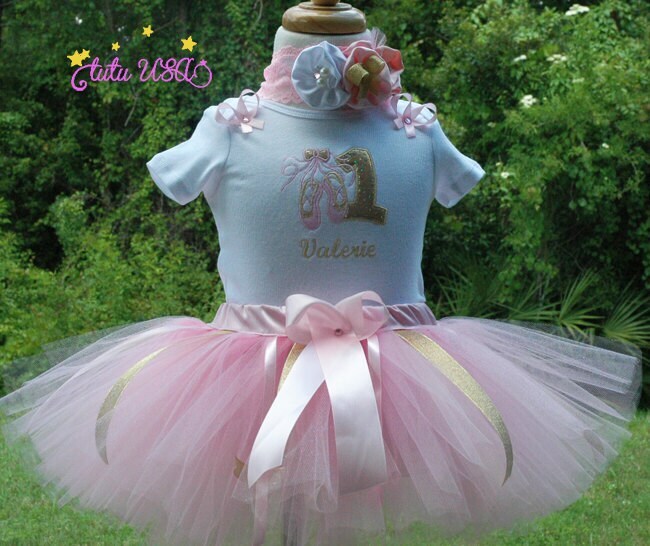 I have used many soft pink colors including sparkly pink tulle to create this beautiful tutu. The shirt will be machine embroidered. Bow can be placed on a clip or headband. The bow will made by hand, I do not put any wires in the bows. There are many accessories you can add to this Ballet Slippers Tutu Outfit such as: diaper covers, birthday hat and socks.